In this post I’m going to give you a bit of information regarding the Category Files Administration tool that has been around since 10.0.5.2. It is a generic tool that handles files in the database but it can be configured to view files of a specific category so this tool is also the Mashup File Administration and the Startpad File Administration. The Startpad in 10.0.5 and 10.1 is a separate install which some customers do not install so in 10.0.5 you might just have the Mashup File Administration but it is in fact the same tool as below it is just that you are not allowed to change category. 1. Category Selection. There are currently five possible categories. Default canvas files, Mashup, Shared files, System files and Startpad (optional). When you select a category all files in that category will be listed in the file list. 2. The File List – A list of all files and when they were last modified. The changed by column show the last user who changed the file. It does not mean that the file was changed from within the tool, it can be that a user added a shared link in the S3.xml or edited a propery in the profile. The Connect Roles and Users column is just to give you a quick overview if the file is only available to a set of users. If the file can be connected to roles/users depends on the category. Only the Mashup and Startpad category supports connecting roles and/or users. 3. Actions. Once you have selected a file all the buttons will be enabled. The file list does not support multi select so you can only select one file at the time. All buttons except the new button requires a file to be selected. If some buttons are not visible they are not supported for the category. This might be controlled by a setting. One example is in the Mashup category where ‘Enable Mashup Deploy’ has to be set to true. The update button is great if you for example has manually updated the links file or the profile file. The file you browse to do not have to have the same name as the file you would like to update in the list. You select the file you would like to update and then press update and select a file to be uploaded. Note that for some versions of Smart Office you need to do a dummy change in the Profile Editor for the profile cache to be up to date. The File detail area will be disabled for all categories except for Mashup and Startpad. The Mashup and Startpad are the only category files that you can control per role and/or user. It is possible to have a specific default canvas file but that is controlled by adding a rule to the Canvas property in the Mango.UI section in the Settings Editor. The reason we added categories even for files that does not support the role/user mapping is simply becuase it reduced development time. Instead of adding a lot of different tools we reused the existing tool add as we moved a lot of files from the file system to the database. We are taking these steps becuase we would like to support scale out in the future and then we can’t have any files on disk. I think we have a lot of admin tools already and I hope to see a consolidation in the future, but we are resistant to removing tools since it might be confusing to existing customers. 4. File access level. This section is only applicable for files in category. Access none means that the file is uploaded but in draft and will not be downloaded by any clients. Public means that it is accessible for all and role means that only roles or users visible in section 7 will download the file. This only applies to Mashups and Startpad files. 5. User ID entry. There you can connect and allow specific users to access the file by typing their user ID and pressing Add user. If your Session Provider supports name lookup you will get a username in the list but you still need to know the User ID and enter it manually. 6. Available roles from the Session Provider. This section shows a list of available Session Providers. Only the Windows Session Provider, LDAP Session Provider and SAML Session Provider support roles. The DSSO session provider does NOT support roles. Lots of customers use DSSO and I’ve been trying to push for this functionality for the DSSO session provider. If you would like this functionality I suggest you enter a request to support listing roles (for the DSSO Session Provider). 7. Roles and users with access. 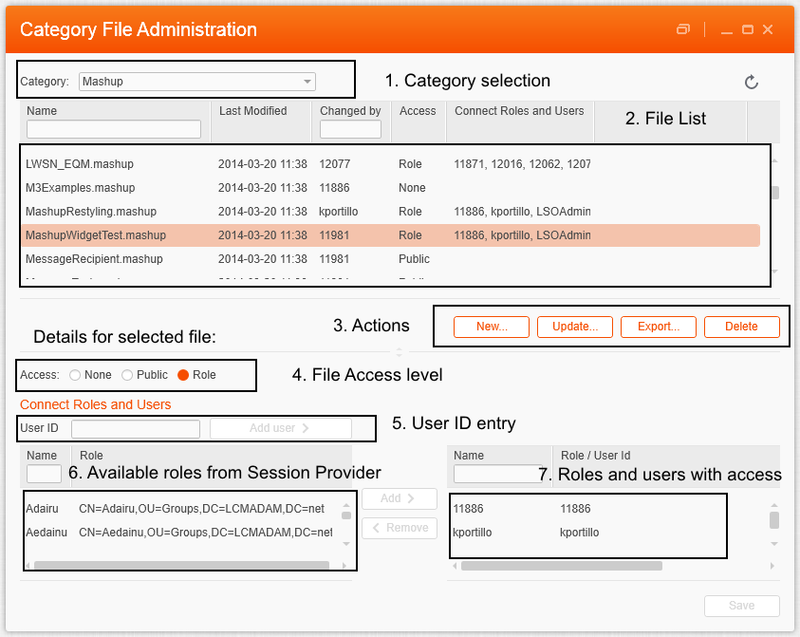 This list shows you the users and/or roles that have access and will download the selected file. Please note that those connected entities will only have affect if the Access type is role (and for category Mashup and Startpad). If you change the access level to Public you can expect the connected entities list to be cleared so you will lose any connections added. Default canvas files storage. To connect the file to a role/user you cannot use the section with the roles. You connect a specific template to a role by adding a Rule with the name of the file in the Settings Editor in the Mango.UI section. The name of the setting is ‘Canvas” see picture below. Think of this category as a storage for the file but the confiugration is done in the Settings Editor. If you would like to have another default canvas than the one delivered, replace (update) the LawsonCanvas.jade file with a saved canvas file with other content. All Mashups deployed from Life Cycle Manager or the Grid Management Pages (10.2 only). Mashups can be connected to specific roles and or users if the Session Provider supports it. Note that this category is only available if the Mashup scheme is enabled/allowed. Startpad files that contain public deployed startpads. Note that this category is only available if the Startpad feature is installed and enabled in the profile when you run this tool. There are global files shared with all users. Different features can store files in this category. M3 and Lawson use this category for storing shared links. Please note that these link files must have the name with slash in them. You can update those files by selecting them in the list and clicking update but if you manually need to add a new file with a slash in the name you need to first click new – import and then right click to get the context menu and select rename. These files are related to the Infor Smart Office framework. Features are not allowed to store files in this category. profile.xml – The profile.xml is the list of profiles that you can edit via the profile editor. template.xml – contains the template for what to create when a new profile is created. You can export and manually remove old blocks in the template. Smart Office does not remove block when features are uninstalled so after a few years there might be unused blocks for features that you might not have installed anymore. users.xml – the list of users who have used the built in collaboration service. This file is not used in version 10.2 and later. In that version they are stored in the collaboration tables in the database. There is an error message the first time you start the tool if your Session Provider (installed in the grid where Smart Office is running) does not return any roles. The error message is “Unable to load the list of available roles. Please check the client log for more information.” In the case of DSSO the session provider actually implements an interface so that Smart Office expect roles but the LSF backend (Landmark identity provider has never supported listed roles) does not support listing roles or in some versions of the backend there is an exception when looping over an empty list. When roles are not listed in section 6 you can only connect individual users by using the input section 5. The DSSO session provider does not support listing roles becuase the LSF identity provider and the Landmark identity provider does nor have that functionality. If you would like this functionality I recommend you to enter a request to support (it should be directed to DSSO session provider or LSF (Security) or Landmark (Security) and not Smart Office. You also have the option of using the Windows session provider or the LDAP Session provider but it will have other implications as well. Internally at Infor we use both the LDAP Session Provider and the DSSO Session Provider (in different installations of course) for running Lawson Applications in Smart Office. If you would like to use the Category File Administration tool or the Mashup File Administration tool (it’s the same tool) to upload and manage your Mashups you must set the Enable Mashup Deploy to true in the Settings Editor for Mango.Core. If the action buttons are not visisble it is because you have disabled it in the Settings Editor. You should also be aware that the file format for the Mashup is a .mashup file. This is in fact the Mashup project file so it can contain several mashups. It is not allowed to upload a .lawsonapplication file here but if you change a .lawsonapplication to a .zip application you can unzip and get the containing Mashup. You can also build a .mashup file from the Mashup Designer if you are developing the Mashup. But for all categories it is important to upload the correct file type. In Smart Office 10.2 there is also a Grid Management Page that can be used for installing Mashups. This means that there are other options to using Life Cycle Manager (LCM). 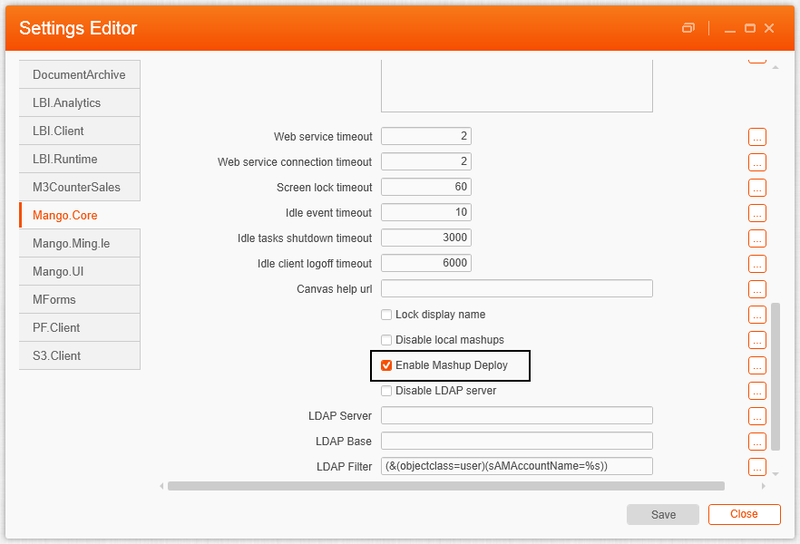 Please note that Mashups installed with LCM and the MangoServer Grid Management Pages will still be visible in the Smart Office tool but not the other way around. Something that every customer should do is to replace the default canvas with their own default canvas. If you still would like to keep the old default you need to do the following. In Smart Office you can save your current canvas and use that as a templates. The default canvas only applies to users who have never run Smart Office. There is however one exception to the rule and that is if Disable changes to user Canvas is checked in the Mango.UI settings. That setting has a really bad name because changes are allowed but they will not be saved so if you restart you will have the default canvas file again. 3. Press the new button and browse to the file. 4. Open the Settings Editor and select Mango.UI. Change the name of the Canvas setting by changing the value or add a rule by clicking the button next to the input field. In my example below I have created a rule and you can see there is a Rule because the button has an asterisk. The profile.xml is one of the files where you might want to take a backup or manually remove unused entries. Depending on your Smart Office version this can also be done in the Profile Editor’s advanced tab. In Smart Office Mashups and features can add entries to the settings and those settings are not cleared when the feature is uninstalled. This entry was posted in Smart Office Administration and tagged Mashup, Profile on August 13, 2014 by Karin Portillo.